The Custard TV: First look at the new drama from Doctor Foster creator. First look at the new drama from Doctor Foster creator. We recently got the cast confirmation for Mike Bartlett's new drama Press which will arrive on BBC One next year. 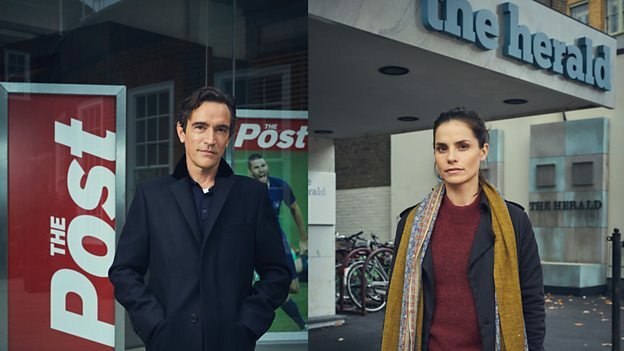 The new drama from the writer of Doctor Foster is a six-part drama set in the fast-paced and challenging environment of the British newspaper industry, Press will immerse viewers in the personal lives and the constant professional dilemmas facing its characters. The series follow their lives as they attempt to balance work and play, ambition and integrity, amid the never-ending pressure of the 24-hour global news cycle and an industry in turmoil. The drama, which currently filming in London will Charlotte Riley, Ben Chaplin and David Suchet. Press will air in 2018 on BBC One.